Two graves in Bergen op Zoom, a memorial at Soarremoarre and a handful of photographs are among the reminders of the pilots who risked their lives and dropped food parcels over the Netherlands during the Second World War. 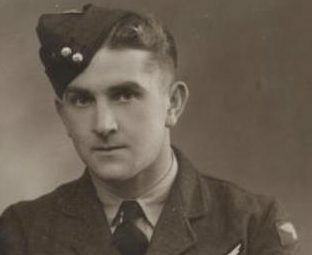 As a boy Vic Jay wanted to know all about the Lancaster bombers his father flew during the Second World War, but like many veterans, Bob Jay was reluctant to talk about it. Vic’s curiosity waned as he got older, and when Bob Jay died of stomach cancer in 1974, at the age of 55, he left behind a slate of unanswered questions. 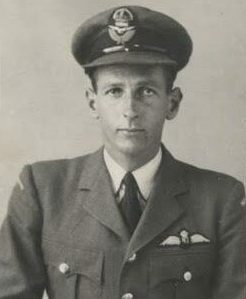 Vic knew his father had been a flight engineer in a New Zealand squadron and flew bombing missions over the Netherlands during the last two months of the war. That taxi run in April 2012 was the start of a five-year quest by the retired schoolteacher to unearth as much information as he could about his father’s former colleagues. As Vic’s research took him deeper into his father’s story he collected poems, drawings, letters and photographs. One particularly poignant artefact was a photo of the bomber on its final mission, with Bob’s head just visible in the cockpit. He found the transcript of an interview the pilot, Bill Mallon, had given in 2004. Mallon and three of the other crew members were New Zealanders who had travelled halfway round the world to fight in Europe, but Vic managed to track their families down and obtain vital pieces of what was becoming a large and intricate jigsaw puzzle. He visited and interviewed the last surviving member of the team, Charles Green. What had begun as a blog had become a major historical project that was eventually condensed into a book, The Mallon Crew, published in 2016. Unlike many war histories, it focuses less on heroism, strategy and the mechanics of flying and more on the stories of the crew members, both during the war and afterwards. 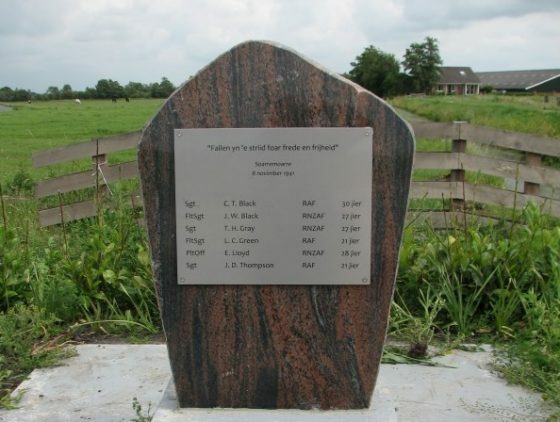 One of the New Zealanders Vic’s project brought him into contact with is Lorraine Gray, whose father, Trevor, is commemorated in a war memorial at Soarremoarre, near Akkrum in Friesland. Lorraine never knew her father, who set sail for Canada then Europe two days before she was born in May 1941 – she believes the distress of separating brought on her mother’s contractions – and was shot down less than six months later on his way back from a bombing raid over Berlin. 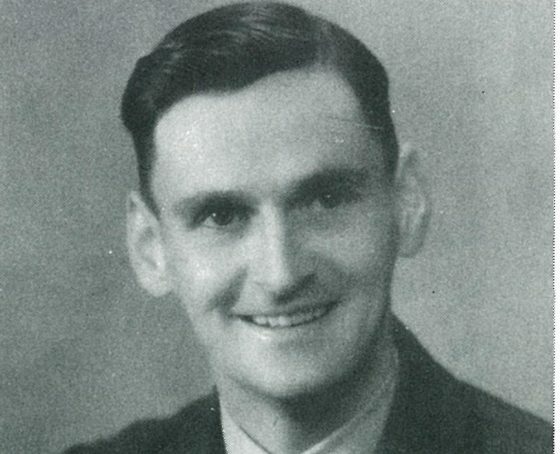 As the Wellington bomber fell to earth, Sergeant Trevor Gray and the rest of the crew are believed to have steered it away from the village and into a peat bog, sparing hundreds of lives. It was so firmly embedded in the ground that the bodies of the airmen were not dug out for another six years. When they were, Sgt Gray was found to have gone down carrying a photograph of his infant daughter. Like Vic, Lorraine only discovered the full story of her father’s wartime service decades later, when the Dutch Missing Airmen Memorial Foundation, based in Leeuwarden, invited her to unveil the memorial in 2010. When she was growing up in the coastal town of New Plymouth, Taranaki, the war was a constant presence but rarely mentioned directly. ‘My father was missing, later identified as killed, on a bombing raid but that was all I knew. The fact was simply absorbed into the general sense of the war which pervaded our home,’ she wrote in an email to DutchNews. She has a clear memory of her grandmother running out of the house waving a tea towel and shouting ‘it’s over, it’s over’ when news of the ceasefire came through. Lorraine was sent away to a Quaker boarding school, where the Quaker code of pacifism precluded any discussion of the war. ‘Nobody ever spoke of my father to me,’ she said. ‘All I knew was that he had been killed in the war, by flying a bomber plane.’ Years of silence followed. A veterans’ business association called Heritage sent her a book for her birthday each year and a gold watch for her 21st, but she was only vaguely aware why. Her mother remarried, coincidentally to a Dutch migrant. The letters Trevor wrote to his family were preserved and collected by her uncle Max, who left them to Lorraine when he died at the age of 93, but these, too, only reached her when she was in her sixties. The memorial in Akkrum was unveiled in 2010, shortly after Pieter discovered the box of papers in the attic and two months after Lorraine’s mother died. For her the unveiling was another step in the process of putting the pieces of the past back together. 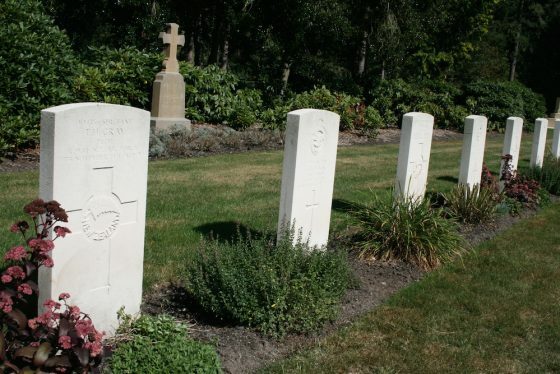 On her way to Friesland she stopped to visit her father’s grave at the Commonwealth War Cemetery in Bergen op Zoom, where the airmen’s bodies were laid to rest after being recovered from the plane. She was struck by the number of people that turned out for the ceremony, including RAF and Dutch air force personnel, airmen’s families and the New Zealand ambassador, as well as dozens of primary schoolchildren. The idea of a permanent memorial had first been proposed four years earlier by children at two local schools in Akkrum and Aldeboarn. Bergen op Zoom is also the last resting place of Tom Mallon, one of two brothers of Bill Mallon who died during the war. Vic Jay visited both graves in 2016, on a trip that also took in the First World War battlefield at Ypres. ‘I sat in front of a computer for five years looking at the statistics and the number of people who were killed, and the tragedy touches you, but not to the extent that it does when you see the lines of gravestones,’ says Vic. ‘Bill Mallon’s niece sent me an email six months ago which really brought tears to my eyes, because for the first time I felt what the families must feel. It was only in researching his father’s story that Vic realised why his parents’ generation were so reticent about their wartime experiences: the horror of what they lived through was so traumatising that they were unable to articulate it. It was left to the postwar generation to give a voice to their parents’ experiences.